The first cover horse of The Arabian Breeders’ Magazine had to be very special indeed and so when the Ajman Stud asked me which horse I would like, one name instantly sprang to mind: AJ Mardan. 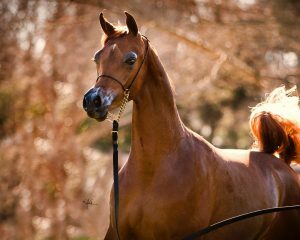 This vibrant five-year-old chestnut stallion has captivated so many since he was a young colt and now, it is his progeny that are wowing us in the show-ring. Very much at the heart of the Ajman Stud, owned and founded by HH Sheikh Ammar Bin Humaid Al Nuaimi, Crown Prince of Ajman, AJ Mardan has been much admired across Europe and the Middle East. Part of his charm is down to his natural showiness and expression, but a lot of this admiration lies in his beautiful pedigree. Foaled in 2011, AJ Mardan is sired by the late, great Vervaldee, and there is much of his sire about him. Vervaldee was sired by another incredible horse that passed away all too soon, Versace. A son of the influential stallion Fame VF (Bey Shah x Raffoleta-Rose by Raffon out of Leta Rose), who combines the fabulous Gainey bloodlines with those of Bey Shah and thus, Bask (Witraz x Balalajka by Amurath Sahib out of Iwonka III). Vervaldee’s dam, Giavanna, reinforces that Bey Shah blood as she is his paternal granddaughter, being sired by NV Beau Bey (Bey Shah x Bint Miss Fired by Gdansk out of Miss Fire). In turn, Giavanna is out of Precious as Gold, a daughter of El Shaklan (Shaker El Masri x Estopa by Tabal out of Uyamia) and out of Autumn in Gold (Classy McCoy x Julieann by Baarouf out of Mailace). This line through Autumn in Gold also carries the Gainey blood through Classy McCoy (Aarief x Fersara by Ferseyn out of Bint Sahara). 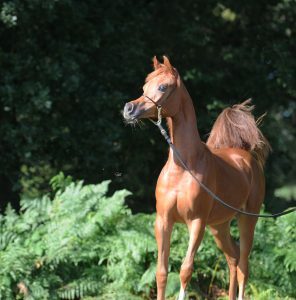 Vervaldee was bred in the US by John Brown and Robert Williams of Rojo Arabians, and then purchased by Andrea and Paul Taylor of Tucana Arabians in the UK. Astute breeders chose Vervaldee and were rewarded with typey, beautiful foals that went on to garner championships across Europe. 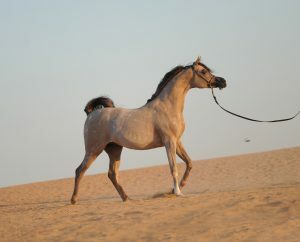 Vervaldee was first leased, and then sold to, the Ajman Stud in the United Arab Emirates. There, with access to some of the most beautiful mares in the world, Vervaldee sired incredible offspring that would take titles across the Middle East before turning their attention on Europe. These included the multiple champion mare AJ Siyadah (ex Sweet Caroline LL by Legacy of Fame by Legacy of Gold out of Fames Elegance C) and AJ Mardan. AJ Mardan’s dam is Felicia RLC, who is now eight years old and still has much to offer. She was the 2010 Arabian Breeders’ World Cup Junior Female Champion in Las Vegas and the same year, she took the Reserve Junior Female Championship in Scottsdale. 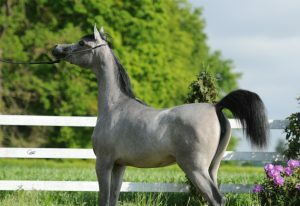 Felicia is sired by Shael Dream Desert, a son of the straight Egyptian Ansata Shaamis (Ansata Halim Shah x AK Faressa by Prince Fa Moniet out of AK Nameesa) and out of Elettra by World Champion Hadidi (Norus x Hebet Allah by Morafic out of Sohier II), also a straight Egyptian. 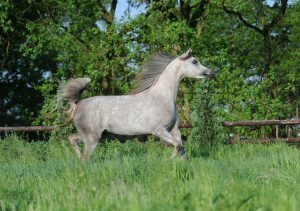 However, Elettra herself brings in Russian lines through her dam, Afrodite (Andoy x Papele by Prizrak out of Parijanka). Completing AJ Mardan’s illustrious pedigree is his maternal granddam, Camelia K. Bred by Murilo Kammer, she is sired by Donatello K (Encore Ali x Liberty Bey C by Bey Shah out of Siiri) and out of Cameo Bey (Bey Shah x Tsylvestra by Tsatyr out of Bar Nuhacz), thus bringing more of the Polish/Crabbet lines, as well as an infusion of Ali Jamaal (Ruminaja Ali x Heritage Memory by El Magato out of Heritage LaBelle) through Donatello K.
The combination of the gentle, beautiful, classic Vervaldee with the Egyptian gracefulness of Felicia RLC is very much reflected in AJ Mardan. He is strikingly beautiful, tall and rangey, with tremendous expression and attitude. As a young colt, he wowed audiences across Europe and the Middle East, earning titles including the Gold Junior Male Champion at the Ströhen International Show and Gold Yearling Colt Champion at the All Nations’ Cup in Aachen. AJ Mardan finished the year by taking the Bronze Yearling Male World Championship title in Paris. 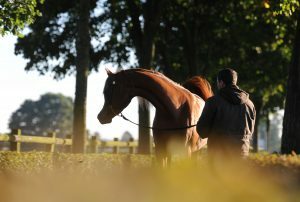 However, AJ Mardan’s significance at the stud is much more than through being a show horse – it is a sire for which he is so respected by all that come into contact with him. His natural beauty shines through, and he is producing better than himself time and time again. Indeed, by the time AJ Mardan was four years of age, he had already sired a World Champion Colt and European Triple Crown winner. This is a potent sire, one with all the natural qualities needed to become a true sire of note over the coming years. From his first foal crop, AJ Mardan, the sire, impressed. Bred as a two-year old, he sired a World Champion in the form of AJ Azzam. This grey colt, born in 2014, is out of Ysadora (Marwan Al Shaqab x Ysabela by Parys El Jamaal out of EA Moongyspy Echo) and he, too, has echoes of his grandsire. Typey and flamboyant, AJ Azzam is the next in this wonderful male line from the Ajman Stud. AJ Azzam’s first show was the Tulip Cup in 2015, where he took the Silver Yearling Male Championship. From then on, it was gold all the way as AJ Azzam conquered the Wels International arabian Horse Festival. Come the European Triple Crown shows, AJ Azzam took the Gold Yearling Male Championship at each show – at the All Nations’ Cup, at the European Championships, and at the Paris World Championships. This meant that, not only had AJ Mardan sired one of the most successful yearlings in recent Arabian breeding history, he had also struck gold himself, siring a Triple Crown winner. This year, AJ Azzam showed at the Dubai International Arabian Horse Championships, where he once again took Gold. With nothing left to prove, AJ Azzam is now enjoying life in the paddocks; the next step in his life is yet to come. AJ Azzam had a full sister born in 2015, AJ Nurai, and she, too, is following in her famous brother’s footsteps. She has just taken the Gold Yearling Filly Championship at this year’s Al Khalediah Arabian Horse Festival in Poland, and we can expect AJ Nurai to continue to shine over the coming months and years. AJ Mardan also produced a special filly in his first year as a sire. 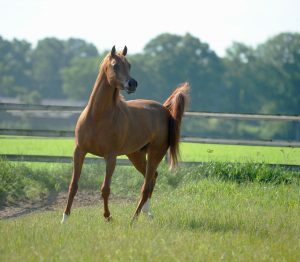 This was AJ Emana, sired by double World Champion and European Triple Crown winner, Emandoria (Gazal Al Shaqab x Emanda by Ecaho out of Emanacja), who the Ajman Stud leased for two seasons. AJ Emana has been a consistent filly, taking time to mature, but her grace and elegance shine through continually. A Bronze Champion Yearling Filly at the 2015 Bruges International Show, AJ Emana has all the beauty and elegance that one would expect from the cross of AJ Mardan with Emandoria, and I just know that she will be a very special filly once she has matured. Another filly from AJ Mardan’s first foal crop is AJ Adab, out of the Ajman Moniscione (WH Justice x Anthea Moniscione by Padrons Ghibli out of Armonia) daughter, Anette Moniscione (ex Aura Moniscione by WH Justice out of Anette by Nariadni). 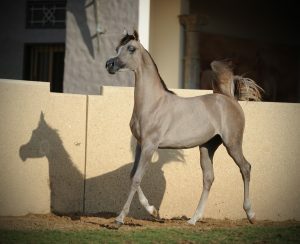 This lovely grey was awarded the Gold Yearling Female Championship at the Sharjah International Arabian Horse Festival. The success of AJ Mardan continued into his second foal crop. 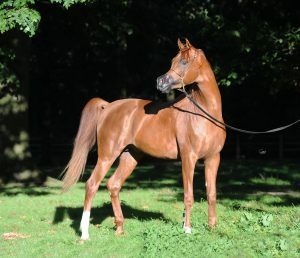 This included the very beautiful and elegant chestnut filly, AJ Rafiqa. This lovely filly is extra special as she is out of a mare bred by the Ajman Stud, AJ Rahifa (Ajman Moniscione x Thee Rahiba by BJ Thee Mustafa out of HMT Farima), and the extra infusion of Egyptian blood has resulted in an incredibly exotic filly. Shown for the first time this year, AJ Rafiqa won her yearling filly class at the Arabian Horse Organization’s World Cup in Chantilly this August, and went on to be garlanded Gold Yearling Filly Champion. She is one to watch for sure. In 2016, more amazing foals sired by AJ Mardan were born, including AJ Radman, a full brother to AJ Rafiqa. He also had a very special colt named in honour of his grandsire, AJ Vervaldee. 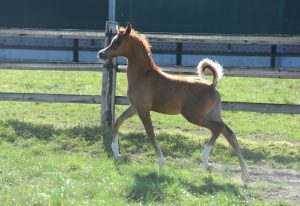 This young colt is out of AJ Veronika, a daughter of Vervaldee, and out of Azalea B (Marwan Al Shaqab x Amelia B by Magnum Psyche out of Amety B). To be given his grandsire’s name is an honour, and hopes are high for him. AJ Mardan has not just produced for the Ajman Stud, however, and his 2014 chestnut colt BS Karanji, owned and bred by Brigitte Sprave, has also done well in the show-ring. BS Karanji is out of Kadira (WH Justice x Karma II by Nagadir out of Kromka), and this year alone, he has been named Silver Junior Male Champion at the Bruges International Arabian Horse Event, and placed second in strong classes in the Arabian Horse Organization’s Breeders’ Championships in Chantilly and second in Ströhen. AJ Mardan brings so much as a stallion – which is just as it should be. He takes the very best of a mare and adds to it, bringing his own special look and elegance that so caught my eye those few years ago when he won in Aachen. AJ Mardan puts on a beautiful head and a large, expressive eye. He creates a ‘look’ – just what you want from a stud. And with just three foal crops on the ground, we have not yet seen the best of what this young stallion can do. However, I do believe that we can expect great things. AJ Azzam and AJ Rafiqa already show that AJ Mardan has what it takes to go into the history books. But with just three foal crops on the ground, he is already surpassing expectations. And nowhere is this more evident than with an incredible filly foal that AJ Mardan sired this year – AJ Norah. AJ Norah is out of the Ajman Stud’s multiple champion mare, Inspired Najla, sired by Ajman Moniscione and out of the straight Russian mare, Natalia (Narym x Nebylica by Balaton out of Nitroza). Born this spring, AJ Norah is an extremely feminine and beautiful chestnut filly – so beautiful that she has to be seen to be truly believed. Her video is enchanting, and there is no doubt that she will fill the big shoes her older siblings have left for her to fill. 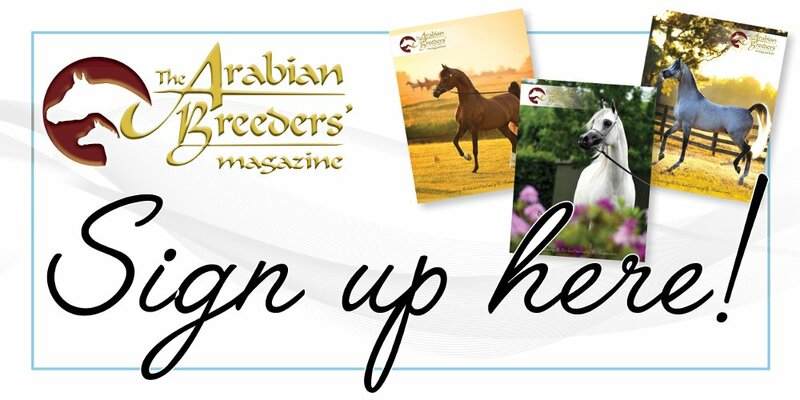 In this special first edition of The Arabian Breeders’ Magazine, it is only right to celebrate a homebred stallion who is already proving to be a fantastic producer. I am not alone in saying that I cannot wait to see what comes next from AJ Mardan – and I know that he has been bred to some very special mares for 2017 foals. 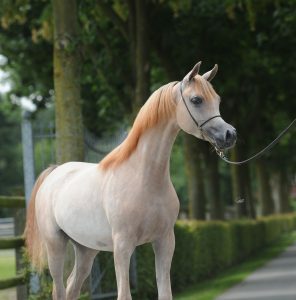 This is a stallion who will undoubtedly leave his mark on the Arabian breeding world in many different, extraordinary ways, and all of them will be special.